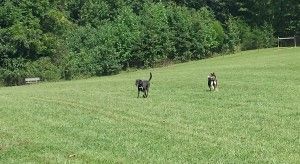 I wrote recently about the dog park at Dunkirk District Park, which is a place my two dogs really love. However, I thought it was time to revisit the one on Grays Road in Prince Frederick. The first time I was there, it was a frigid February day. I don’t have good memories of it, but that’s probably because I was so cold. I know our founder, Clif, takes his dogs there quite often and have a blast with their dogs and meeting new dogs. It was much, much better this time around. I suppose the weather made a difference. I also enjoyed that we had the park all to ourselves. While it’s more secluded than the one in Dunkirk, it is nicely maintained. You’ll need to bring your own water bowl and toys because those are no longer available at this park. A sign is posted stating that these were removed because of a few cases of canine influenza here in Maryland (none of them were in Calvert County, though). Additionally, you’ll need to bring a muzzle if you have an unneutered male dog. 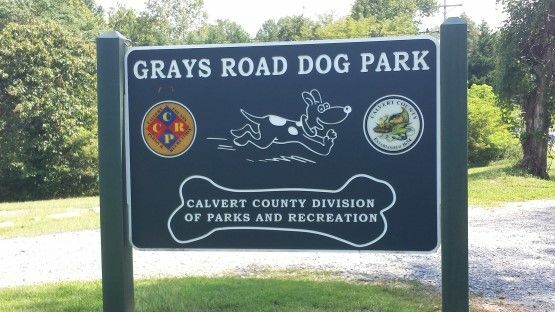 Signs are posted about this at the entrance to Grays Road Dog Park. Park amenities include plenty of benches, a bag dispenser, trash can and drinking fountain (though these last three items are outside of the play areas). Pumps are also available to fill up your water bowls. A porta-potty is located by the gravel parking lot. You will find four different fenced-off sections, two of which are reserved for smaller dogs. All of these play areas offer a generous amount of room for your dog to run around to its heart’s content, though the play areas for large dogs offer the most space. There are a few shady spots, but most of the Grays Road Dog Park is fully exposed to the sun. My dogs had a great time at this park, too, so we may venture out to Grays Road Dog Park more often. There is no pool for Blitz to splash around in, but they both left happy and exhausted. In fact, it’s awfully quiet in the house now as I write this. Maybe a little too quiet. I'm an Air Force wife from Ohio who moved from Germany to Seattle to Calvert County. This area charms me for its proximity to Chesapeake Bay, the friendly people, and its natural beauty. I live in Huntingtown with my husband and two dogs - Reece and Blitz. Follow me on G+.